The boys are officially 2nd and 3rd graders! They were very excited to be headed off to school today. For the first time they will be in separate schools in separate towns. Patrick is looking forward to learning cursive writing! Bennett is looking forward to being “top dog” in his school as the 2nd graders are the oldest. He is also excited about eating breakfast at school since he goes early so Patrick can catch the bus! They were excited to pick out their “first day of school outift”. I remember laying everything out on my bed and deciding which was going to be that first day outfit and then of course the next day and so on. I remember catching up with all my friends about our summers. Since I lived in the country, I didn’t have many opportunities to see my classmates over the summer. I remember the excitement of playing outside for recess while the weather was still beautiful, the girls jumping rope and the boys playing football. I have noticed that not much has changed in the last 25+ years. 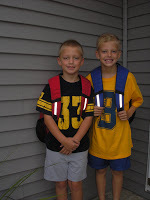 We look forward to picking the boys up and hearing about all those happenings on their first day of school.